Hyundai’s smallest SUV is big on surprises. The 2018 Hyundai Kona brings sportiness to the small SUV range. 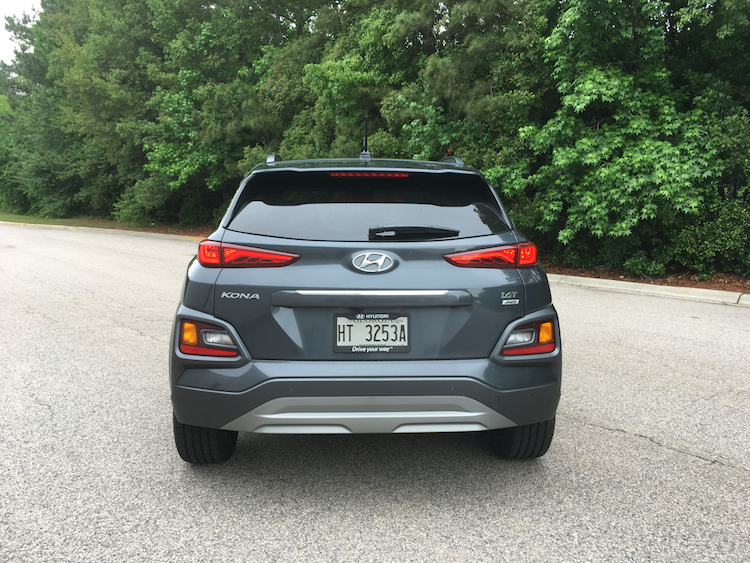 Let it be known that Hyundai arrived late to the subcompact SUV game. Let it also be known that despite its late entry, the 2018 Kona ranks up there with the very best models available. 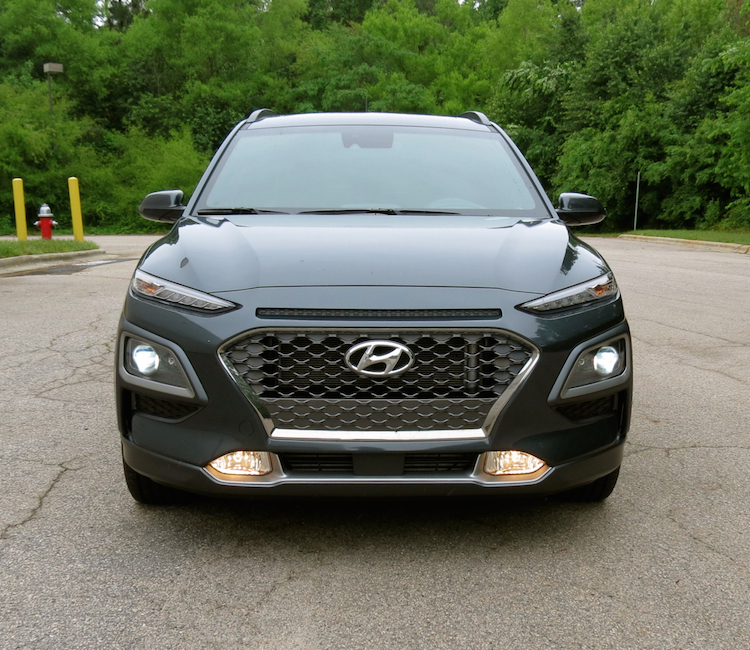 Indeed, the 2018 Hyundai Kona may have been a long time coming, but the result is a model that matches well against the competition. And not only that, the all-new Kona is stylish, relatively affordable and offers available fun-to-drive characteristics. Hyundai offers the 2018 Kona in four trims: SE ($19,500), SEL ($21,150), Limited ($24,700) and Ultimate ($27,400). Add $980 for the destination charge. Front-wheel drive is standard; all-wheel drive (with a multi-link rear suspension) is a $1,300 option. Hyundai offers two engine choices and two transmission options. The Kona arrives as Hyundai shakes up its utility vehicle offerings. Slotting beneath the compact Tucson, the Kona is joined by a pair of midsize models: Santa Fe Sport (5 passengers) and Santa Fe (7 passengers). Beginning in 2019, the two models will be known respectively as the Santa Fe (5 passengers) and Santa Fe XL (7 passengers). As implied, the little Hyundai is named for the Kona community on the west side of the Big Island. Interestingly, the Kona’s arrival to the market coincides with the eruption of the Kilauea volcano, which resulted in Hawaii’s most powerful earthquake in decades, never mind the intense lava flow and the destruction it has caused. Pele is mad and maybe offering a Hyundai Kona sacrifice will appease it. Is it worth a shot? As for the model at hand, it has an unmistakable sporty flair in its design. Its front fascia reminds me of the previous-generation Jeep Cherokee with its narrow LED daytime lights at the top with separate headlamps and fog lights below. The Hyundai grille has a distinct crown shape and the hood offers multiple creases. Along the sides, you will find deep sculpting, contrasting wheel wells and an upswept belt line. I especially like the touch at the rear roof pillar with the ribbed design meeting the liftgate spoiler. At the rear, you will find narrow wraparound tail lamps and puzzle-like combination lamps. Standard equipment includes automatic headlights, LED lights, 16-inch alloy wheels and a rear spoiler. Among the upgrades, you will find LED headlights and taillights, front fog lights, cornering lights, roof side rails, a power tilt-and-slide sunroof, power heated side mirrors, and 17- and 18-inch alloy wheels. You can also order a contrasting roof color — light gray or black — on select trims. Small SUVs mean correspondingly tiny cabins. But at least with this Hyundai, space is used wisely. 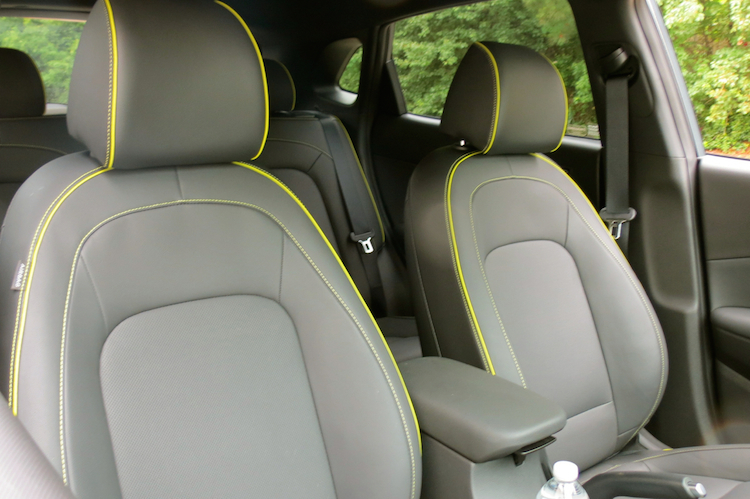 It also makes for a usable rear seat, something the Ford EcoSport barely offers. I found the driver’s seat quite comfortable and very good sight lines present. On paper, Hyundai shows room for five. Four is more like it. Cargo space measures 19.2 behind the second-row 60/40 split bench seat. Fold the seat down and you will find 45.8 cubic feet. 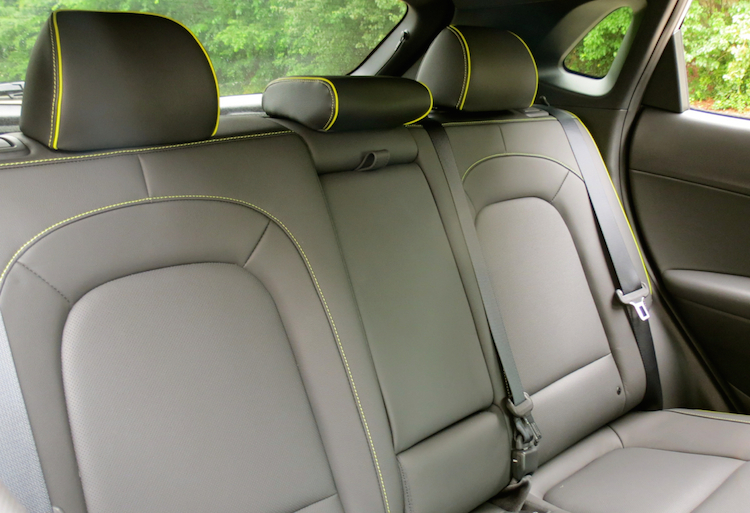 That’s less than what the Honda HR-V and Mazda CX-3 offer, an arrangement that benefits seating room in the Kona. Hyundai supplies a temporary spare and a storage compartment under the floor starting with the SEL trim. I will describe the Kona’s interior as “playful,” as in fun. My test model came with eye candy in the form of lime accents circling the vents and ignition button and the transmission shifter. Lime piping graces the seats as well. You will also find an instrument scoop, a large open area at the base of the center stack and ample in-door storage areas. The Kona is definitely geared toward youth who might toss camping gear inside or fit a surfboard on top. Standard equipment includes power windows and door locks, cloth seats, a tilt-and-telescopic steering column and air conditioning. Options include a power driver’s seat with lumbar support, leather-trimmed seats, heated front seats, illuminated vanity mirrors and an automatic dimming rearview mirror. Customers want tech features and Hyundai is very accommodating. The standard audio package includes six speakers, USB ports, an auxiliary audio jack, a seven-inch touch-screen display, Android Auto and Apple CarPlay compatibility, and Siri and Google Now support. The connectivity features are at the top of their game — some luxury manufacturers still do not offer them or, as in the case of BMW, charge extra for them. Options include HD Radio, satellite radio, wireless phone charging and an eight-speaker Infinity audio system. Blue Link connected car services come with the Ultimate trim exclusively. On the safety front, all models have a rearview camera. Blind spot collision warning with rear cross-traffic assist is standard on all but the base trim. An available SEL Tech package adds Hyundai Smart Sense with forward collision avoidance assist with pedestrian detection, lane keeping assist and driver attention warning. The Ultimate model adds a head-up display, high beam assist and reverse parking distance warning. Hyundai supplies two engine choices with the 2018 Kona. The first engine is a 2.0-liter inline-four with 147 horsepower and 132 pound-feet of torque. This one is also found in the Elantra and works with a six-speed automatic transmission. The Limited and Ultimate models have a turbocharged 1.6-liter inline-four cylinder engine, generating 175 horsepower and 195 pound-feet of torque. Hyundai pairs this engine with a seven-speed dual-clutch automatic transmission. My test Ultimate came with the hotted-up engine. I’ll reserve my comments about the base engine, which I’ve experienced in the Elantra. Suffice to say, it will get you where you’re going, but not with much excitement. As for the turbo…oh, yeah! Once you get past the attendant turbo lag, the engine takes over with authority. Step-off acceleration is decent, but full-on power is a blast. My test model had all-wheel-drive and a multi-link independent rear suspension. This combination means the Kona is playful and tossable — take it on a twisty road and you may forget you are driving a utility vehicle. That the Kona sits relatively close to the ground is a benefit too — body roll was virtually non-existent. The transmission shifts gears with precision, serving up the right gear for the moment. The last time I had as much fun with a tiny SUV as I did with this Hyundai Kona was five years ago. That is when my youngest son and I made the trek through the Appalachians in a Nissan Juke with a manual transmission. The little SUV bobbed and weaved, but it held its own. I’m thinking the Kona would have performed just as well on that trek, especially when pulling out of switchbacks. It acquitted itself nicely when cornering, something not a lot of small cars are able to do. Mark my words: the turbo all-wheel-drive Kona will make a name for itself. The 2018 Kona is more than it has to be, going beyond simply filling a hole in Hyundai’s product line. The new model provides an affordable entry point to the brand and supplies a performance-oriented model when combining the turbo engine with all-wheel drive. A Kona EV joins the lineup this fall, supplying approximately 250 miles of range on one charge. That’s about 100 miles further than the Nissan Leaf I recently drove and should appeal to consumers in markets where the charging network is strong and the incentives generous. You will pay about $27,000 for the Kona Limited with all-wheel drive, reflecting the higher price point for utility vehicles. The smaller storage compartment may be its most significant demerit, but that is partially offset by a larger passenger seating area. 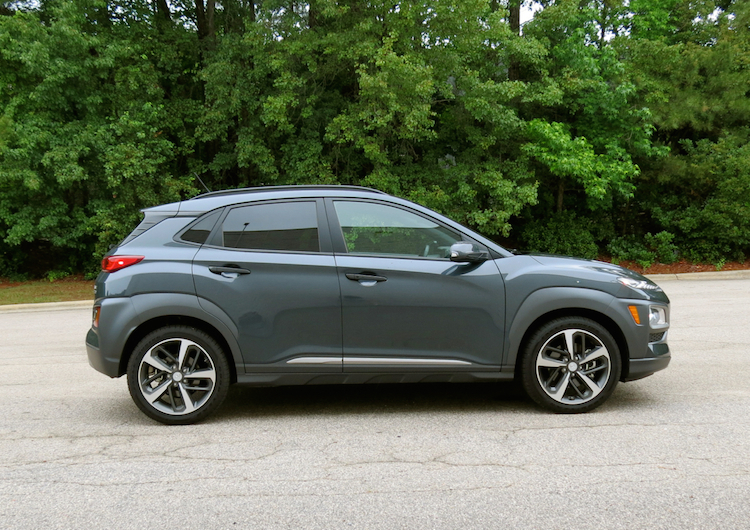 In all, the Hyundai Kona does more than the new Nissan Kicks and makes the Chevrolet Trax seem downright dated.